We were off the ferry at 7am. What a night! Sleeping in a recliner isn’t so much fun!! You pay to have a reserved recliner! There were no cabins but it was only 7 hours so no biggie!! We sat beside a couple from Hamilton. They loved to talk! They had been at a family reunion. It was a very interesting night!!! It was drizzling rain when we got off the ferry so we stopped down the road to put on rain gear. A ways down the road the sun came out and it was so so hot!! We were glad to get that stuff off!!! We stopped for breakfast at the Irving in Canso Causeway. The causeway connects Cape Breton Island to Nova Scotia. The lineup for a table was so long!! We finally sat at the counter stools and enjoyed our breakfast. We continued on to Halifax. It was getting warmer and warmer!! We followed an information sign to the waterfront in Halifax. First stop was the information centre. We asked about rooms. We got a room at the Chebucto Inn. It was quite busy at the waterfront. We just lucked out on a parking spot. A young woman was just leaving so we grabbed her spot!!! We walked around the harbour. I’m sure it was 30! We were sweating buckets!! We had dinner at Murphy’s Restaurant. It was across this little bridge. On the way back a boat went by and the waves made it very rocky crossing. We had lobster roll and seafood chowder!! Yum yum! Mac had fries with his!! We headed to find our hotel. And guess what – we couldn’t find it!!! We stopped and turned around and asked a young man for directions – he said follow me!!! He brought us to the street that we had been on and there was the hotel – we just missed it! We couldn’t see the sign coming from the other way so that’s why we missed it. Room is clean and reasonable. Early night!! We were both so very tired!! It was 7 when we woke up this morning!! Sun was shining tho!!! We walked down for breakfast and it didn’t feel too bad!! By the time we packed up it was around 12 degrees. We stopped about 15 minutes down the road at Western Brook Pond. We didn’t have time to take the boat tour to the fjord but we did walk the 5 km round trip hike to the lake. We had our 10000 steps in early today!! The walk was so peaceful and the Lake was very beautiful. We will have to come back to this one for sure!!! We continued our way through Gros Morne National Park. We did stop and take the pics we said we would on the way back. What a beautiful park – mountains, lakes, windy roads – great for bikes!!! We passed through Deer Lake again to continue our way on the trans Canada. Deer Lake is a long lake – we passed the next town and the lake was still there!! We stopped in Corner Brook for lunch and a run into Walmart to grab a few snacks!! 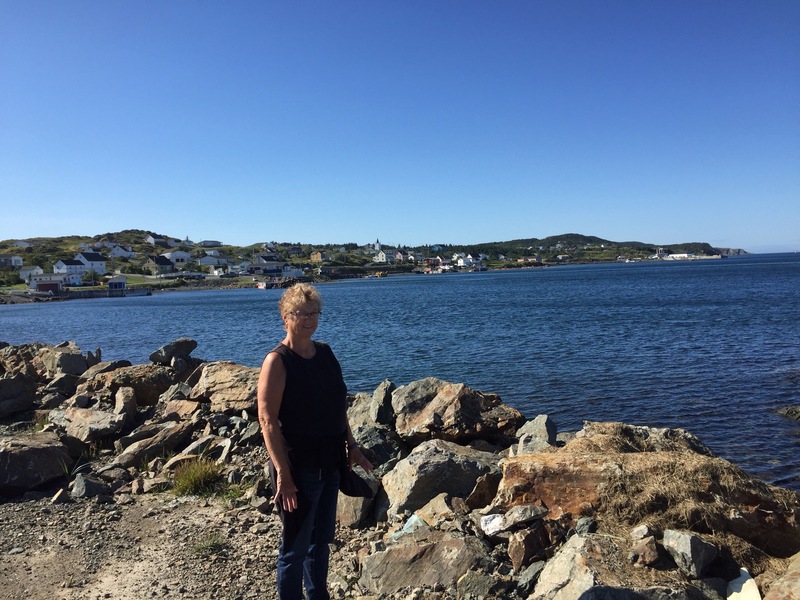 We continued onto Port aux Basques. Encountered more winds as we got closer to the water. Scenery was beautiful. Mountains and water!!! Here we sit waiting for the 11:45 pm ferry to North Sydney. We have 1 reclining chair. That’s all they had left!!! We will do a toss to see who gets it!!! It’s a 6 or 7 hour crossing!! Will be a long night!! We got another chair!!! Look what was parked behind us in the line! See I’m driving!! We are homeless tomorrow! We don’t know where we are going!! We decided not to do Cabot Trail. Too much construction and it’s supposed to rain!! We talked to bikers on the ferry going to Newfoundland and they said it should be closed to bikers the road was so bad!!! We will have to come back!!!! Woke up to drizzling rain!! Yuck!! Went for breakfast and took our time packing up hoping rain would stop!! It did!! 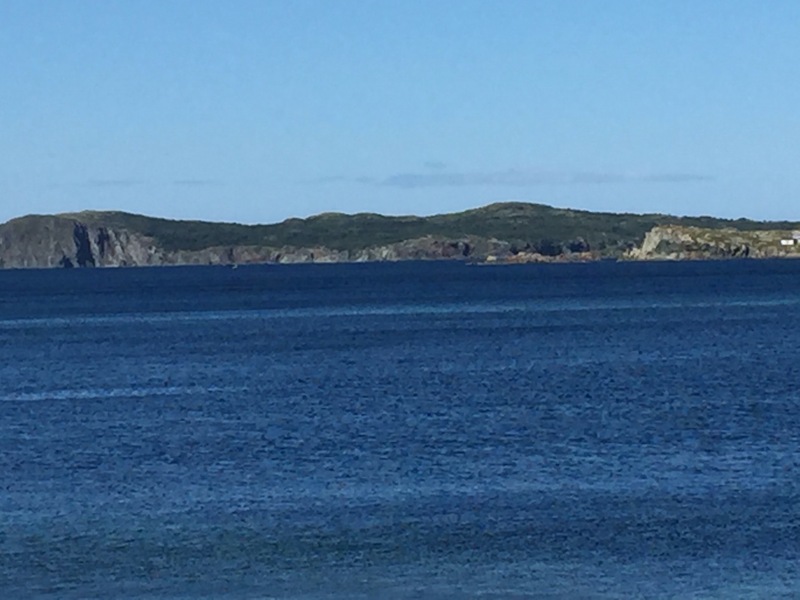 We went for a ride through St Anthony to Fisherman’s Point. 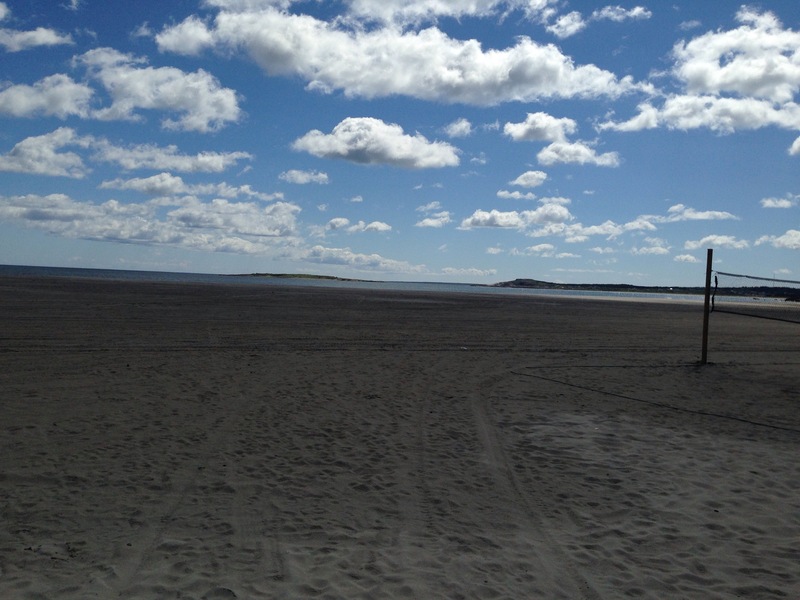 Took a few pics of the Atlantic Ocean. We started our journey back on the Viking Trail towards Cow Head. The winds were unreal!! Guess it’s from Hurricane Gert! The wind was so strong it blew Mac’s helmet off. I had to go back and find it in the ditch. Never saw that before in my life!!! 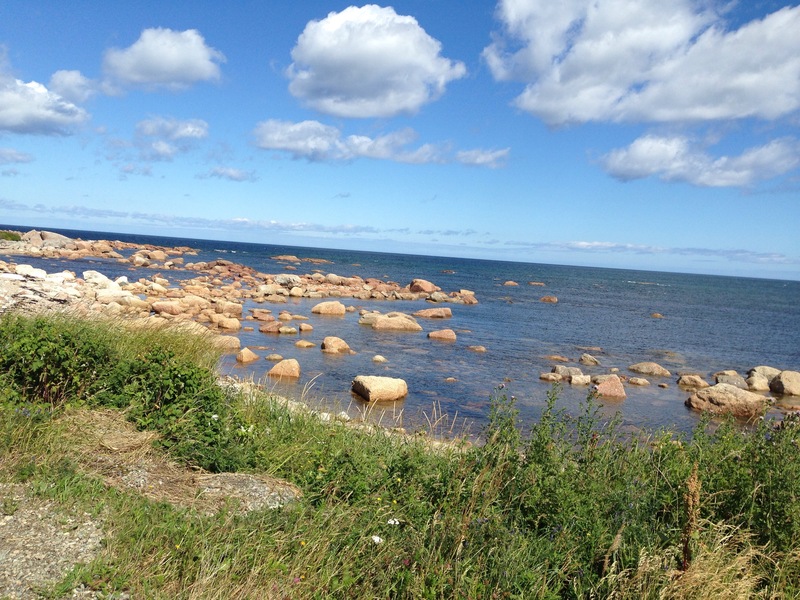 We carried on to Port au Choix. We went into the visitor’s centre and enjoyed moose stew! I actually ate it and it was great. Learned some history of the area. 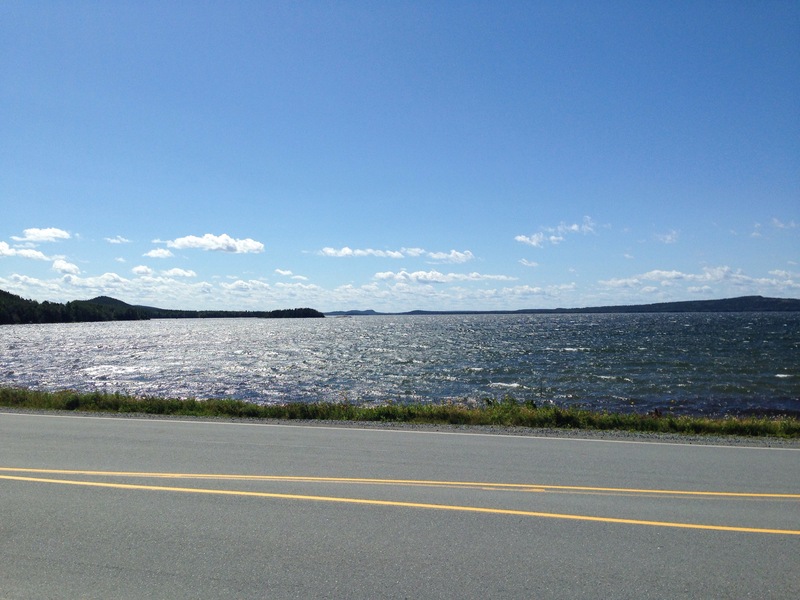 Back on the road again – Poor Mac dealing with potholes, moose and now the crazy wind!! We did see 1 moose off the side of the road. We finally arrived in Cow Head. We checked into our b&b. Not near the same as our suite last nite!!! We went for dinner at Shallow Bay Restaurant – great food! Pics from the dining room. 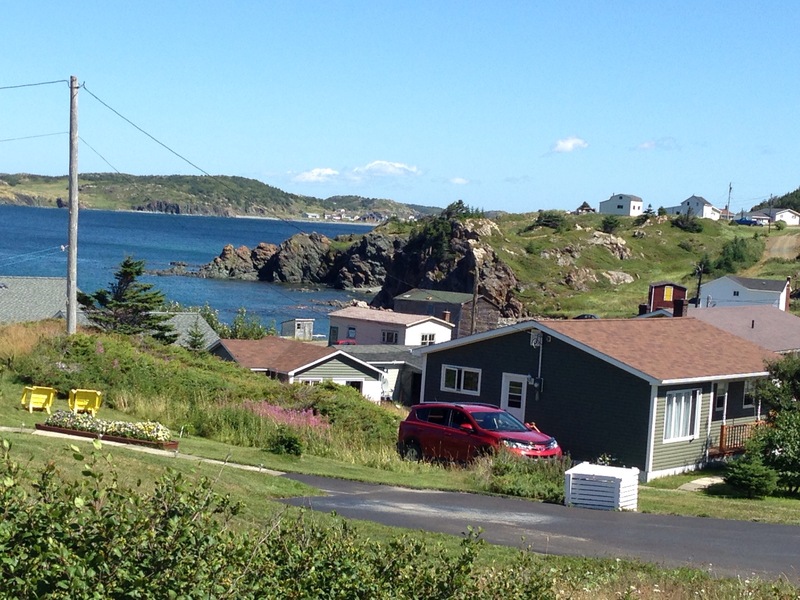 Then off to Newfoundland Vinyl – 6 young people playing Newfie music put out on vinyl from the 50’s,60’s and 70’s. 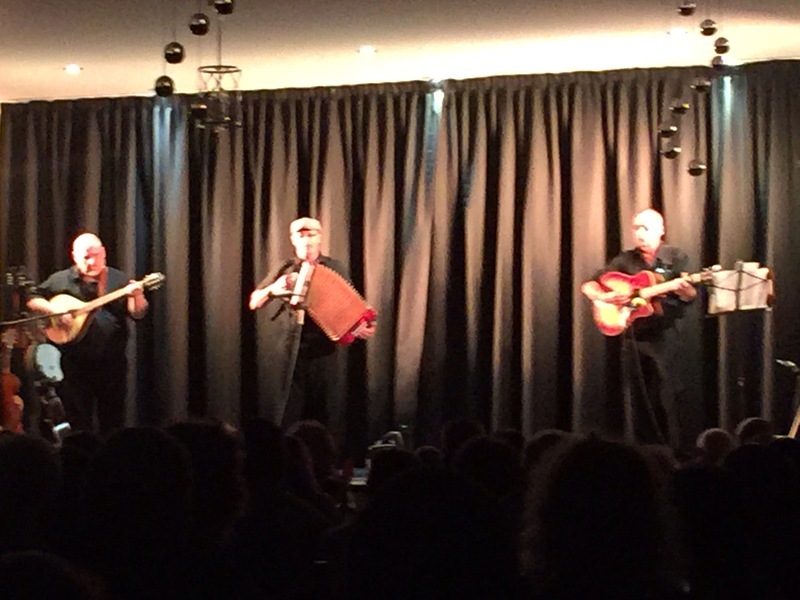 They played every instrument – saxophone, fiddle, guitars, mandolins, something similar to an accordion but I don’t know what it’s called and many others!! They were wonderful!! It was amazing!! We so enjoyed!! Time for sleep!! Been a long long day!! We woke up to drizzling rain! 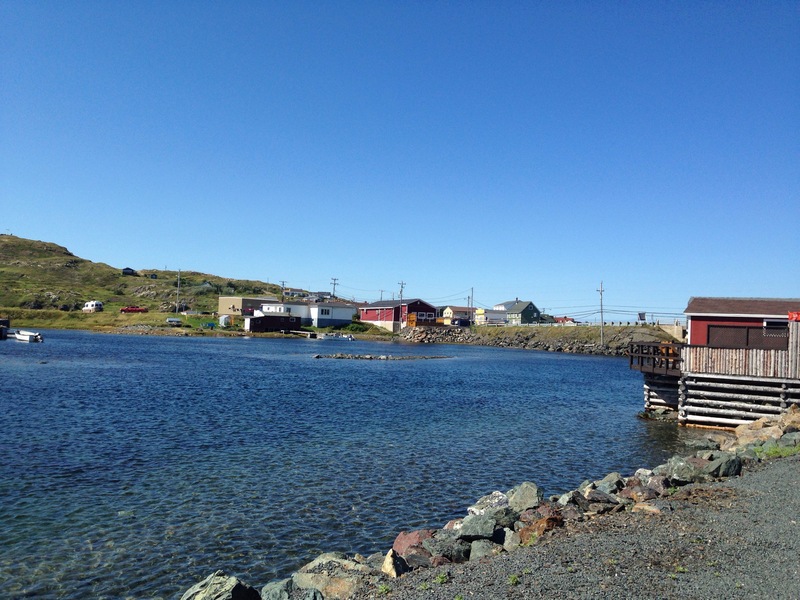 Went for breakfast and then headed to L’Anse Aux Meadows – the Viking ruins. Mac took it slow on the road – parts were quite bumpy and full of potholes but basically not too bad. What an amazing place! We so enjoyed it all! We had a great tour guide who explained a lot to us on the way to the Viking settlement. It started to rain! We went inside the building and another guide continued to give us more information. It was wonderful!!! By the time we left it was raining. We had quite a hike to get back to the visitor’s centre and then another hike to the parking lot. We were soaked. We had rain jackets on but left our rain pants on the bike. We quickly put them on and headed back to our hotel – 30 km in the rain!!! The rain felt like ice pellets. It was quite cold!! When we walked into the hotel lobby we looked like drowned rats. The woman gave us our key for the suite and told us to get our wet gear off and enjoy our room!! Wow!! We have a jacuzzi and fireplace! It’s wonderful!! 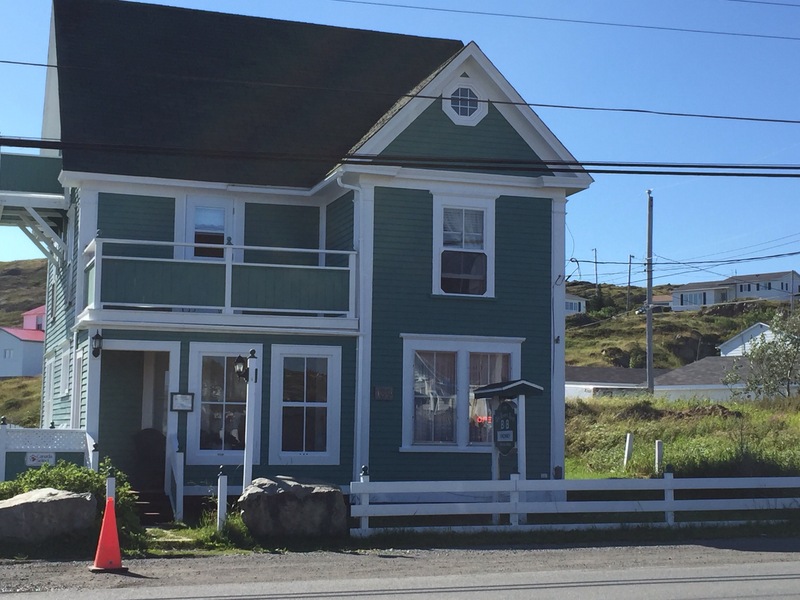 The place is called Haven Inn – they have been so great with us, especially Betty. When we called to reserve they only had 1 night and we wanted 2. Betty said not to worry she would get us a room for the second night. We ended up with this suite for a great price and we are enjoying!! We have our clothes spread out all over trying to dry out!! We were going to the seafood place tonite but we weren’t going back in the rain. We enjoyed another great dinner at our hotel. Took a pic through the window again tonite so you can see the raindrops on the window! Tomorrow we head back to Cow Head. Wifi still won’t let me post with pictures so will post without for now . I know not the same!!! We met up with the couple and the baby from the b&b at The Arches! We finally arrived in St Anthony. Drizzling rain!! Not fun! We checked into the Haven Inn. Room is ok. We are staying another night here but different room – upgrade to suite! Will see how that is!! Still very windy today but the sun is shining. 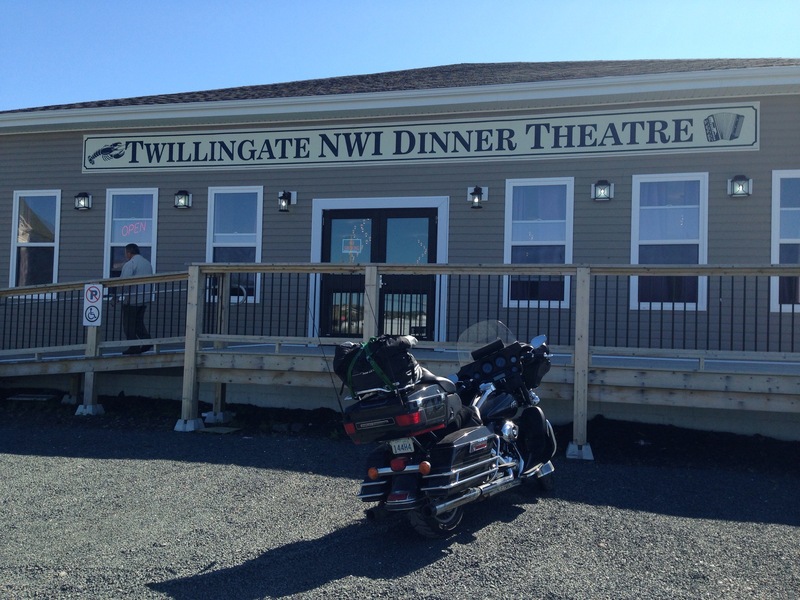 The ride between Twillingate and Lewisport made me very tense. 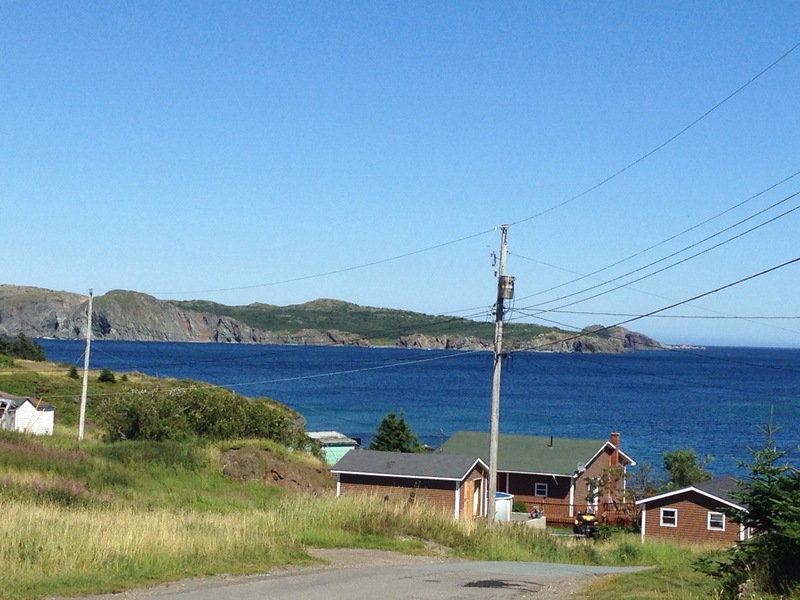 There were so many potholes – the worst road we’ve seen in Newfoundland. We were so glad to take a break and continue on the Trans Canada Hwy. it had potholes too but not as many as the other stretch. My dear family and friends in Thunder Bay – our potholes are like pinholes compared to the craters here. I will never complain again about our potholes – at least our City and Province fix them. Potholes are everywhere – bridges, highways, main roads, side roads, parking lots!! You always have to be watching!! I laugh when they post signs “caution potholes ahead” and you’ve already swerved around at least a hundred before that!!! The scenery was very much like northwestern Ontario. 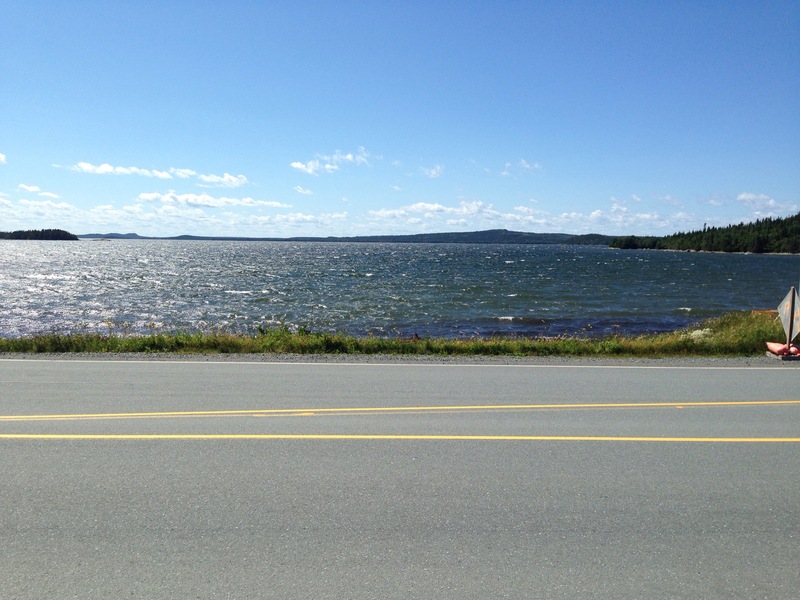 About 80 km before Deer Lake the scenery changed to hills – looking forward to The ride tomorrow – mountains and ocean!! We finally arrived in Deer Lake to this awesome b&b called Lakeview. A super nice hostess and beautiful home! We walked to Deer Lake. What a pretty Lake! We went for dinner at Pizza Delight. 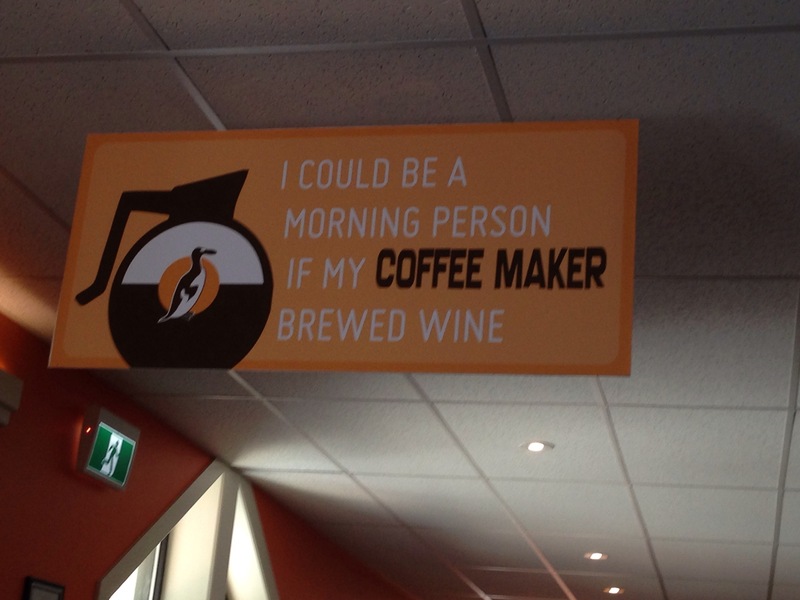 It is everywhere in Newfoundland. So is Robin’s Donuts. We spent the rest of the evening chatting with a young couple from Waterloo. She was from Newfoundland originally and gave us a few suggestions on our trip tomorrow. Another gorgeous day! Sun was shining – just beautiful!! We did the Gander Loop today. One of Canada’s top ten motorcycle rides!! 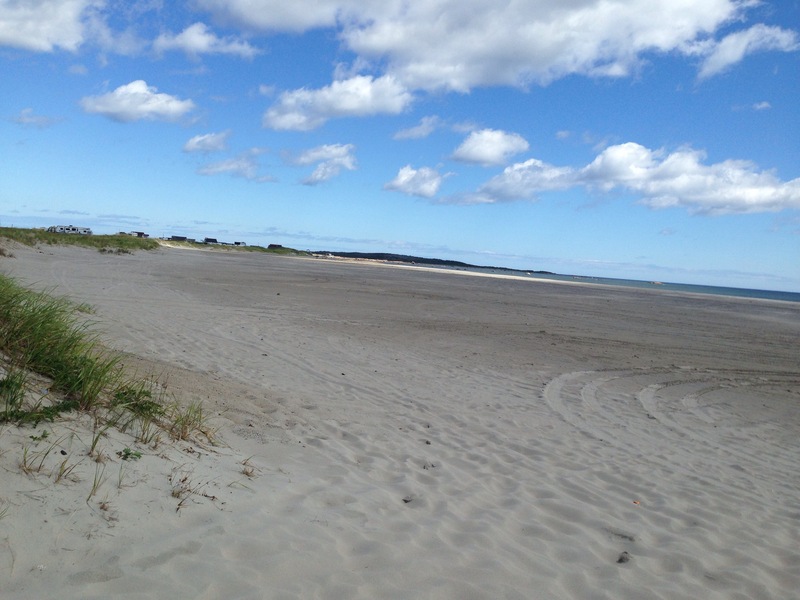 We were told to stop at the beach in Lumsden. Wow!! I have never seen such a beach! We didn’t even walk to the water it was so far away. 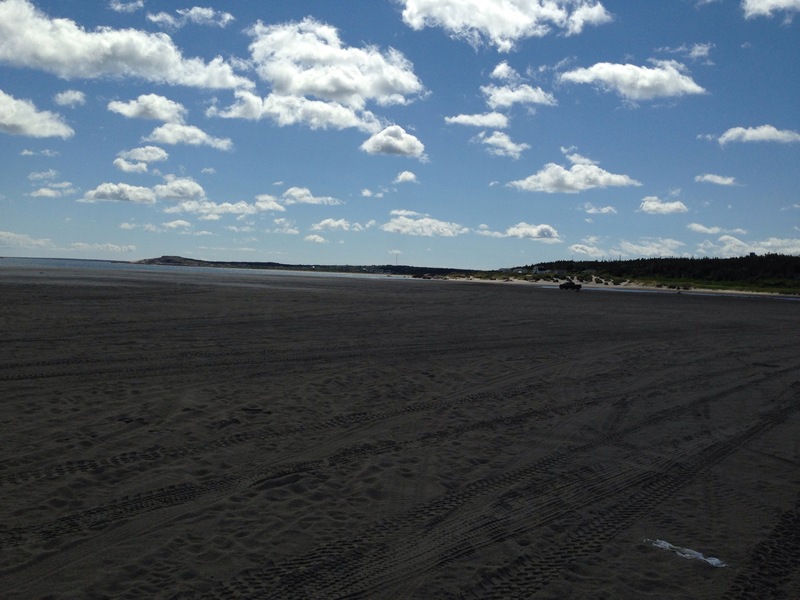 We couldn’t figure out where everybody parked until we got on the beach and saw the tire tracks. You just park on the beach!! On our way to the beach we talked to a couple of men. This boat was being towed. 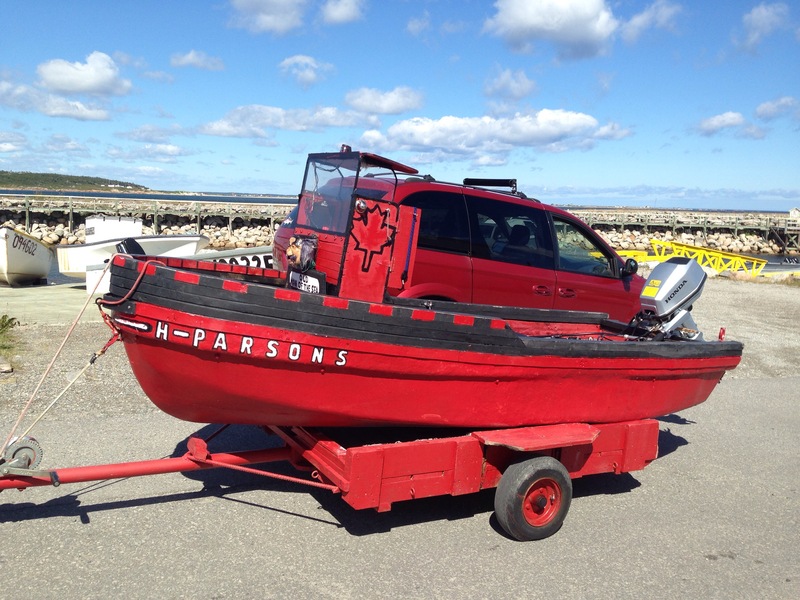 The man who owns the boat is 86 and takes it out in the harbour every day. Isn’t it cute!!! Lots of rocks in the water. 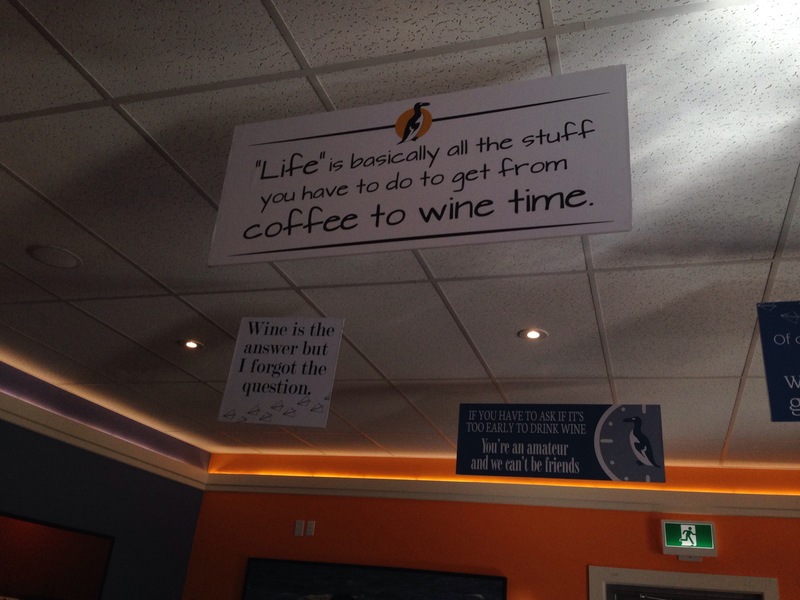 We arrived in Twillingate and went for lunch at a winery. They had theses signs hanging from the ceiling. Mac said they were all me!!! We checked into our bed and breakfast. Pretty cool house!! We took a walk around and took a few pics. We went to a dinner theatre. 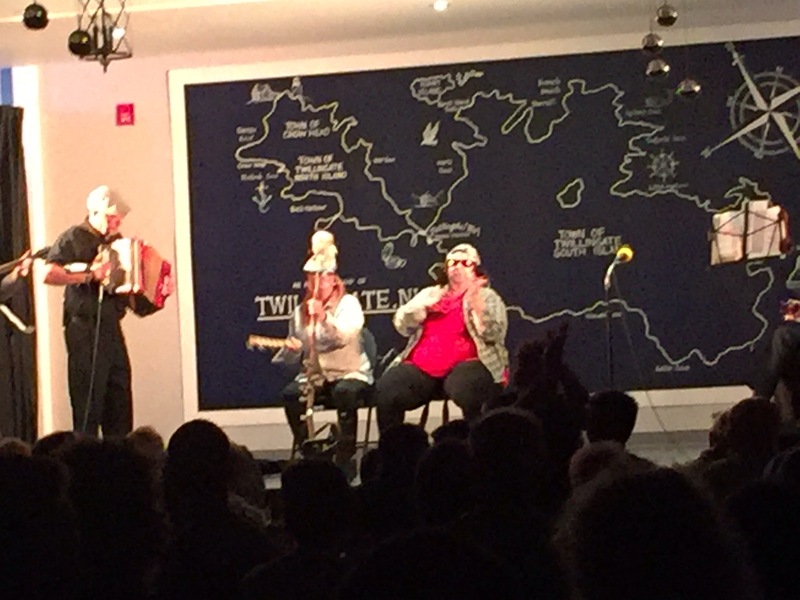 COD dinner was so good and the show was very funny!! The couple we saw at the aviation museum were also there! What are the chances!! !